Welcome to part one of a three-part series on affordable holiday stocking stuffers made with leather! It's been hard getting back to the blog after trying to sift through the mayhem that is applying to medical school. Yet, with the holidays in full blast I couldn't help but craft all the project ideas buzzing in my head! This first project, DIY leather coffee cup sleeves, is a chic (and fairly hipster) project that looks and feels quite luxurious but only cost me around $6-7 to make. That's a steal! As a California gal living on the east coast, I don't do well in the cold. I also don't do well with wasting things. Although many paper coffee sleeves in cafes are recycled, why not just have a reusable one you can easily carry in your bag or wallet? 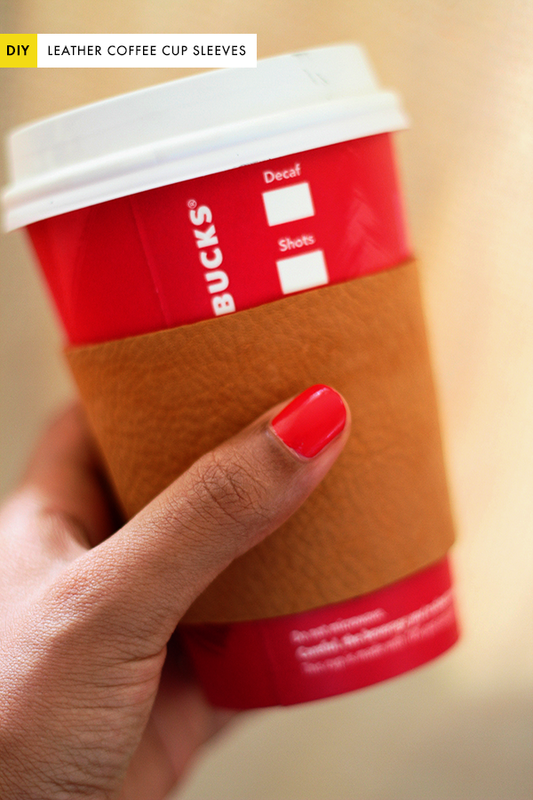 Better yet - snag a reusable coffee mug and you'll essentially save the world (and look good while doing it). Alright, here are the deets! 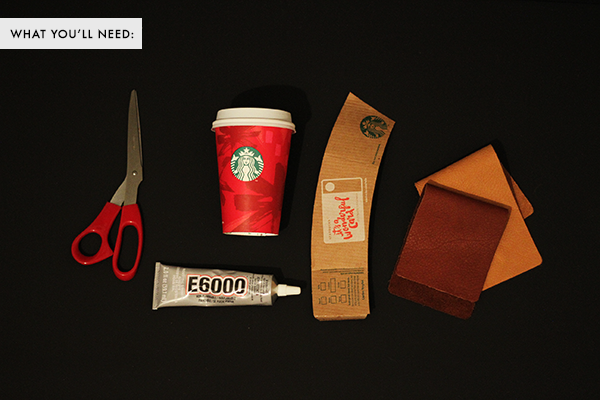 What you'll need: paper coffee cup, coffee cup sleeve (as template), leather (I got mine for $3.99; here is a similar one online at Michael's), permanent glue, scissors, and a pencil. 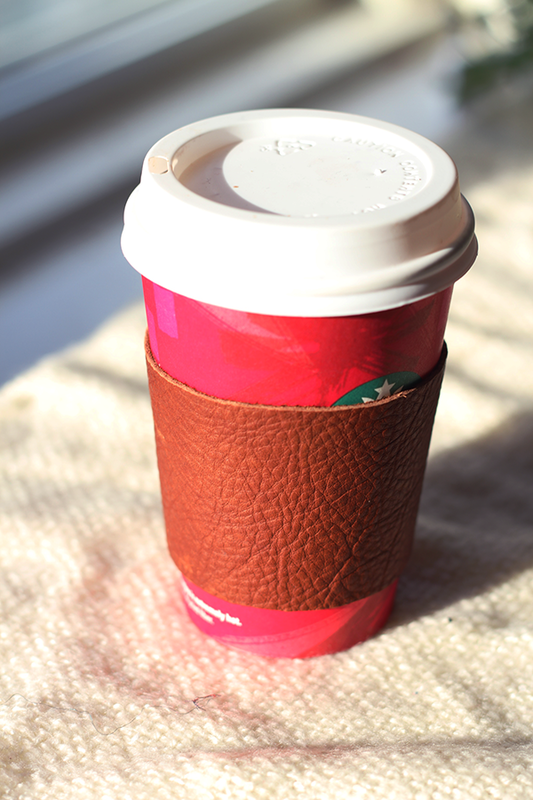 How to make it: trim the paper coffee cup sleeve on each end so it will fit nicely on your leather sheet. Flip the leather over and trace the outline of the paper sleeve lightly. Cut! You'll notice that the leather sleeve at this point won't wrap all the way around. Obviously, if you have a longer piece of leather this won't be a problem, but mine wasn't. So I saw it as an opportunity to keep being artistic with it. To fill this gap, use a piece of scrap leather, flip it over for an 'opposing' color/texture look, and glue to both ends of the sleeves. Trim excess as necessary. I then wrapped a bit of the excess around the top and bottom of the sleeve to complete the look. Wait at least 10 - 15 minutes for the glue to dry and harden before using. That's it! Happy sippin' folks! 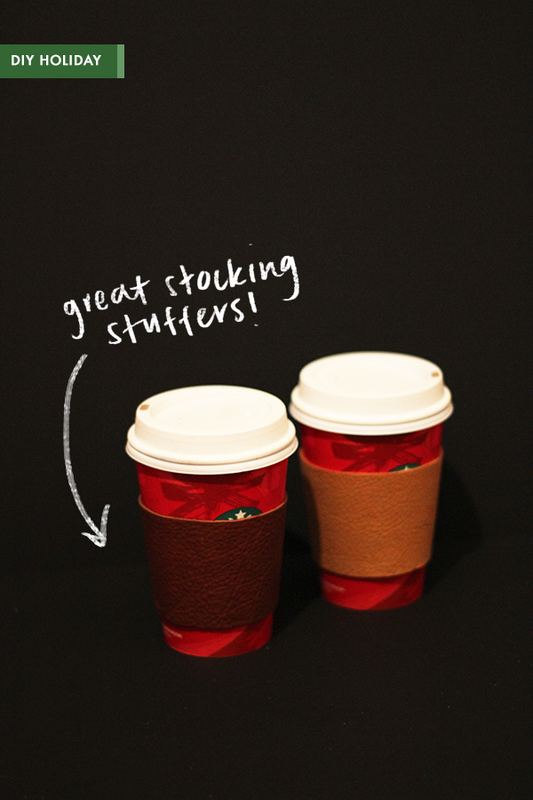 And come back next week for second DIY in this leather stocking stuffer series! These powerful thoughts of yours did impress me. It would be very great if you’ll keep on posting more updates.